Hospital strains of Enterococcus faecium could be characterized and typed by various molecular methods (MLST, AFLP, MLVA) and allocated to a distinct clonal complex known as MLST CC17. However, these techniques are laborious, time-consuming and cost-intensive. Our aim was to identify hospital E. faecium strains and differentiate them from colonizing and animal variants by a simple, inexpensive and reliable PCR-based screening assay. We describe here performance and predictive value of a single PCR detecting the insertion element, IS16, to identify hospital E. faecium isolates within a collection of 260 strains of hospital, animal and human commensal origins. Specific primers were selected amplifying a 547-bp fragment of IS16. Presence of IS16 was determined by PCR screenings among the 260 E. faecium isolates. Distribution of IS16 was compared with a prevalence of commonly used markers for hospital strains, esp and hyl Efm . All isolates were typed by MLST and partly by PFGE. Location of IS16 was analysed by Southern hybridization of plasmid and chromosomal DNA. IS16 was exclusively distributed only among 155 invasive strains belonging to the clonal complex of hospital-associated strains ("CC17"; 28 MLST types) and various vancomycin resistance genotypes (vanA/B/negative). The five invasive IS16-negative strains did not belong to the clonal complex of hospital-associated strains (CC17). IS16 was absent in all but three isolates from 100 livestock, food-associated and human commensal strains ("non-CC17"; 64 MLST types). The three IS16-positive human commensal isolates revealed MLST types belonging to the clonal complex of hospital-associated strains (CC17). The values predicting a hospital-associated strain ("CC17") deduced from presence and absence of IS16 was 100% and thus superior to screening for the presence of esp (66%) and/or hyl Efm (46%). Southern hybridizations revealed chromosomal as well as plasmid localization of IS16. This simple screening assay for insertion element IS16 is capable of differentiating hospital-associated from human commensal, livestock- and food-associated E. faecium strains and thus allows predicting the epidemic strengths or supposed pathogenic potential of a given E. faecium isolate identified within the nosocomial setting. Vancomycin- and multi-resistant Enterococcus strains, especially strains of E. faecium, raise major concerns in intensive care medicine due to limited treatment options . E. faecium is ecologically widely distributed and expected to play a central role as a reservoir and "turn-table" for antibiotic resistance determinants in the bacterial world, and especially among Gram-positive bacteria . A number of molecular typing and characterization techniques such as AFLP, MLVA and MLST and comparative genomic hybridizations allowed differentiating strains of E. faecium and allocating them into various clonal complexes as based on core as well as accessory genome content [3, 4]. Isolates belonging to hospital-associated clonal types (for instance, MLST CC17) could be identified and a supposed enhanced spreading potential among the nosocomial setting for isolates of this specific subgroup is predictable . Reports from recent years described increasing annual rates of E. faecium bacteraemia in European countries [5, 6]. When investigated in greater detail, the increase was due to increasing numbers of hospital-associated clonal types of E. faecium (MLST CC17) whereas numbers of other clonal types remained constant over time again emphasizing the aforementioned increased potential for nosocomial spread . The molecular techniques to identify hospital-associated E. faecium strains are laborious, time-consuming and cost-intensive and are thus not applicable for routine diagnostics. Results of recent bacterial, epidemiological, microarray-based and genomic studies suggest that a number of markers are enriched among hospital strains of E. faecium including collagen adhesion factors acm and scm [7, 8], other matrix-binding proteins and pili [9, 10], a supposed hyaluronidase, hyl Efm [11, 12], biofilm-associated markers including the enterococcal surface protein gene, esp [13, 14], and various genomic islands encoding proteins of unknown functions [15, 16]. Having acquired a number of these aforementioned determinants, these strains may have an increased pathogenic potential [4, 10, 17]. However, distribution of these markers among hospital strains is not exclusive and thus the predictive value is limited in terms of specificity and sensitivity. Certain markers possess pseudogenes and partly deleted variants complicating establishing a simple PCR based screening test [8, 17]. Acquired ampicillin resistance appeared as a phenotypic trait of hospital strains, at least in Europe; however, this feature is also prevalent among non-hospital strains in some parts of the world, such as Asia and North America [18–20]. Microarray based genomic comparisons revealed a specific mobile element, insertion element IS16, exclusively prevalent among hospital E. faecium strains from an international collection of isolates . In the present study, we established a PCR-based IS16 screening test and evaluated its robustness, sensitivity, specificity and predictive value for 260 pre-characterized isolates of E. faecium from different human and animal sources. IS16 was localized in a subset of E. faecium isolates (n = 45) representing 29 MLST types by Southern hybridization. Available E. faecium genome data were examined for the presence of IS16 homologous sequences and a genetic association of IS16 with genomic markers is discussed. Our laboratory serves as a Focal Laboratory for Enterococci in Germany. In general, enterococcal isolates sent to us are pre-selected for being vancomycin- and multi-resistant or with the suspicion of clonal spread (local, regional, and country-wide outbreak analysis). Our collection of E. faecium test strains included 160 invasive isolates (blood cultures) from 60 different German diagnostic or hospital laboratories isolated between 1995 and 2007. Blood culture strains were pre-selected by geography and hospital origin, year of isolation, and different van genotypes (van-/A/B). The blood culture isolates were compared against 68 human commensal (outpatient) isolates from four different prevalence studies performed in different parts of Germany (1996, 1997, 1999, 2003) [24, 25] and 32 isolates from animal (chicken, pigs) and meat samples (broiler, pork) (1994, 1995, 1999) [21–23]. In all cases duplicate isolates were excluded based on clinical/epidemiological data (same patient/hospital or animal sample/flock) and of molecular typing results (for instance, based on SmaI-macrorestriction using PFGE for human commensal isolates [24, 25]; unpublished results). Antibiotic susceptibilities were determined by microbouillon dilution in MH bouillon. Ampicillin resistance is defined by an MIC of >8 mg/L and vancomycin resistance by >4 mg/L (http://www.eucast.org). Summarized data are presented in Table 1 and detailed information is given in Additional files 1, 2, 3. Ethical approval was not needed for this study; all strains were pre-selected and were received anonymously from German microbiological or hospital laboratories. Prevalence of epidemic markers among E. faecium isolates from different origins (see also Figure 1 and Additional Files 1, 2, 3). BC MLST CC17 (second line) shown in italics (n = 155) is a subgroup of all blood culture E. faecium isolates presented in the first line representing all isolates allocated to the clonal complex of hospital-aascoiated strains (CC17). AmpR, ampicillin resistance; 1 including two isolates of ST65 representing a singleton but known to be found only among clinical strains; 2 all three belonged to the clonal complex of hospital-associated strain types (MLST CC17; 2x ST18, 1x ST413; see also Additional file 4). Genomic DNA was prepared using a DNA extraction kit (DNeasy Tissue Kit; Qiagen, Hilden, Germany) according to the manufacturer's instructions. An initial cell wall lysis step was added dissolving the cell pellet in TES buffer [10 mM Tris, 0.5 mM ethylene diamine tetra-acetic acid (EDTA), 10% sucrose (pH 8.0)] plus 10 mg/mL lysozyme (Roche Applied Science, Mannheim, Germany) followed by incubation at 37°C for 30 min. Plasmid DNA was isolated using a common phenol/chloroform-based alkaline lysis strategy . PCR was performed with illustra™ PuRe Taq Ready-To-Go™ PCR Beads (GE Healthcare, Freiburg, Germany) according to the manufacturer's instructions. Approximately 0.5 μL of isolated genomic DNA (ca. 10 ng) and primers (200 nM each) were added. Amplification of fragments representing the esp, hyl Efm and vanA/B genes was performed in a multiplex PCR as described elsewhere . The following strains and plasmids were used as positive control samples: plasmid pRUM (IS16), plasmid pLG1 (hyl Efm ); plasmid pIP816 (vanA; E. faecium BM4147), E. faecium U0317 (esp), and E. faecalis V583 (vanB). E. faecalis OG1RF served as a negative control sample for all PCR assays. PCR primers and conditions for screening IS16 elements were as follows: IS16-F: 5'-CATGTTCCACGAACCAGAG and IS16-R: 5'-TCAAAAAGTGGGCTTGGC, annealing temperature was 53°C, the predicted size of the product was 547 bp (reference E. faecium plasmid pRUM; GenBank acc. no. AF507977). Primers were established using software Acelrys DS Gene 1.5. Genomic DNA for PFGE analysis was isolated and treated as described recently . The agarose gel concentration was 1%, the CHEF-DR III apparatus (Bio-Rad Laboratories, Hercules, CA, USA) was used for PFGE. The ramped pulsed times were as follows: 1 - 11 sec for 15 h and 11 - 30 sec for 14 h at 14°C. SmaI-digested Staphylococcus aureus NCTC 8325 was used as a molecular mass standard on all PFGE gels. Chromosomal DNA of E. faecium strains was digested with I-Ceu-I for 16 h at 37°C. Plasmids were linearized by S1 nuclease (TaKaRa, Germany) treatment for 15 min (37°C) and subsequent resolution of the linearized plasmid DNA in PFGE. The ramped pulsed times for I-Ceu-I gels were 5 - 30 sec for 22 h and for S1 PFGE 5 - 35 sec for 22 h at 14°C . Southern hybridization experiments were done as described elsewhere using a PCR-generated digoxigenin-labelled IS16 probe (DIG High Prime; Roche Applied Science, D), hybridization chemicals and equipment from commercial kits and according to recommendations of the manufacturer (Roche, Germany). Immunological detection was done as recommended using a chemiluminescent probe (CDP-Star™, Roche, D) and several readouts were taken at 10, 30, 60 and 120 min in a chemi-imager from Bio-Rad (Chemidoc XRS, Bio-Rad Labs., Hercules, US). PCRs amplifying the seven loci used for MLST were done according to the reference (http://efaecium.mlst.net/). Sequencing reactions were performed according to the manufacturer's recommendations for cycle sequencing of PCR products (Applied Biosystems, Germany). Sequence files were read, evaluated, aligned and compared to the reference set of alleles using sequencing software Lasergene 8.0 from DNA-STAR (SeqMan 8.0; EditSeq 8.0), TraceEditPro v. 1.1.1 from Ridom (http://www.ridom.de), and via the official MLST webpage (http://efaecium.mlst.net/). Phylogenetic trees were generated using software programmes eBURST  for the set of determined MLST types and global optimised eBURST  for the entire set of all available 524 MLST types (http://efaecium.mlst.net/). Statistical analyses were performed with software package EpiCompare 1.0 (Ridom). Based on available sequences (pRUM  or composite (vanB) transposons ) we established PCR primers for an IS16-specific internal fragment (547 bp). Specificity and sensitivity was evaluated against available bacterial databases (BlastN, GenBank). The PCR was established using DNA from reference samples known to be positive for IS16 (plasmid pRUM) and from negative control samples known to lack IS16 (E. faecalis OG1RF). PCR results were as expected and amplified products from reference samples were sequenced for confirming specificity of the amplified PCR product (not shown). Genomic DNA was screened by PCR using the established PCR primers for IS16, esp and hyl Efm . IS16 was highly prevalent among invasive E. faecium (n = 155/160; Table 1) and mainly absent (n = 3/100) from human commensal or animal and meat sources. The three IS16-positive commensal isolates were from humans. Other markers supposedly enriched among clinical or hospital-associated E. faecium isolates were also assessed: the esp gene was prevalent among 64% of all blood culture isolates and 46% of all invasive isolates were hyl Efm -positive (Table 1). None of the 100 non-clinical strains possessed esp or hyl Efm . Ampicillin resistance was prevalent among almost all clinical strains (98%). Two human commensal and two animal isolates were also ampicillin-resistant. All 260 E. faecium isolates were MLST typed. Discriminatory power among clinical isolates (n = 160 isolates; 32 MLST types DI = 0.889 95% CI [0.864 - 0.913]) was much less than among human and animal commensal isolates (n = 100 isolates, 64 MLST types; DI = 0.988; 95% CI [0.983 - 0.994]). This suggests that prevalent hospital-associated clonal types differ less than their colonizing counterparts in animals and humans. In fact, 126 of the 160 invasive E. faecium isolates belonged to only eight MLST types known to represent major hospital-associated clonal types (ST16, ST17, ST18, ST78, ST117, ST192, ST202, ST203) whereas the other 24 MLST types occurred only occasionally. Based on their MLST types and subsequent eBURST and goeBURST analyses, isolates could be sorted into different clonal complexes which were in agreement with their corresponding ecological background (compare also to ). Figure 1 shows eBURST trees generated with all MLST types determined in this study. A phylogenetic tree of all currently detached MLST types (n = 524; 21.04.2010; http://efaecium.mlst.net/) using goeBURST is shown as Additional File 4. Based on these two calculations, almost all (n = 155/160) invasive isolates belonged to the clonal complex of hospital-associated strains (CC17 + ST65 [singleton]). The five IS16-negative clinical isolates represent colonizing strain types not associated with clonal types of hospital strains ("non-CC17"; ST9 [n = 2], ST104; ST271; ST374). 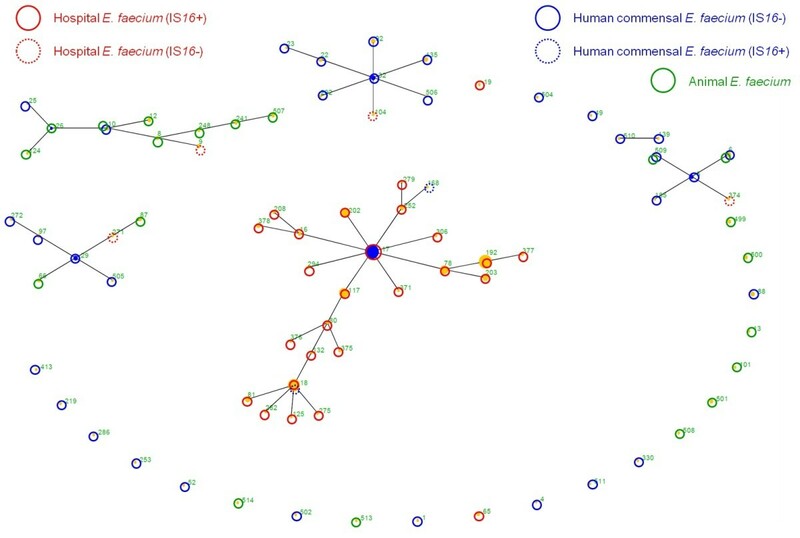 The majority of commensal isolates represented many individual MLST types but belonging to the major clonal complexes of animal and human colonizing strain types (CC5, CC22/36, CC1). The three IS16-positive commensal E. faecium isolates revealed MLST types (ST18, ST413) belonging to the clonal complex of hospital-associated strains (CC17). eBURST cluster of MLST types generated from this set of 260 clinical, commensal and livestock-associated E. faecium strains. (The newly identified MLST types are not presented as well as the following MLST types which appear as singletons in this set: ST39, ST74, ST94, ST289, ST345, ST503, ST413; ST512; compare also to Additional file 4). The origin of the isolates is given in colour codes. ST19 appears here as a singleton but belongs to CC17 when resolved among the entire set of MLST types (Additioinal file 4). The localization of IS16 among 45 representative E. faecium isolates from various origins and altogether 29 different MLST types was investigated. I-Ceu-I digested chromosomal DNA resolved in PFGE and plasmid DNA analysed inS1 PFGE and common agarose gels were transferred onto nylon membranes and hybridized against a labelled IS16 probe. Results are shown in Table 2. If available, several representatives of identical MLST types differing in their van gene content were considered for analysis (see for instance ST17 vanA/B/-negative isolates). In general, the IS16 probe hybridized to (up to three) chromosomal bands suggesting several copies of the same element present in the genome (a single hybridizing chromosomal band could still result from several IS16 copies on it). Four isolates (ST17, ST81, ST202, ST275) showed IS16 only hybridizing to plasmid bands. Twenty-two strains (n = 22/45) revealed a signal for both chromosomal as well as plasmid bands. Hybridization patterns were independent of the van gene content (Table 2). Localization of IS16 to I-Ceu-I digested chromosomal DNA resolved in PFGE and plasmid DNA as based on Southern hybridizations. If available, different representatives of identical MLST types were considered (see for instance ST17 vanA/B/-negative isolates). PFGE, pulsed-field gel electrophoresis; MLST, Multi-locus sequence typing; BC, blood culture; HC, human commensal; *, Hybridization signal with PFGE slot; #, negative results in repeated experiments. Several E. faecium genomes are available as genomic fragments for preliminary analysis (collection I: seven E. faecium genomes; ; collection II: eleven E. faecium isolates from the Human Microbiome Project; (http://nihroadmap.nih.gov/hmp/; http://www.ncbi.nlm.nih.gov//genomes/geblast.cgi?gi=6511#SearchSet). A BLAST search for IS16-related sequences in both E. faecium collections revealed several hits. However, as far as some detailed information was available, the neighbouring DNA fragments all showed different genetic links. IS16 was prevalent among four out of seven genomes in collection I . IS16 was linked to (a) several putative fragments of a conjugative transposon (strain E1162, ST17), (b) ORF involved in sugar metabolism (strain E1636; ST106), (c) a genomic fragment containing other transposases of the IS256 family (strain U0317, ST78) and (d) the supposed pathogenicity island containing the esp gene (strain E1679, ST104). None of the other two strains also containing the esp PAI possessed IS16 within its structure. In the deposited genomic fragments from the Human Microbiome Project, IS16 was infrequently identified, for instance, in E. faecium 1,230,933 linked to a metal-dependent hydrolase or in E. faecium TC6 linked to an extracellular solute-binding protein, family 1. In E. faecium DO a 5' link to a C4-dicarboxylate anaerobic carrier gene and a 3' link to a chloramphenicol actetyltransferase resistance gene followed by a replicase and relaxase genes indicated a supposed plasmid origin of this contig (not shown in details). Available sequence data allow extracting the MLST type related allele information out of the sequenced genomes and a corresponding analysis was done on the seven (collection I) and eleven (collection II) accessible genomes. Of the 11 isolates positive for IS16 eight strains possessed hospital-associated MLST types (ST16, ST17, ST18, ST78, ST203, ST-NEW) and three did not belong to clonal complexes of hospital-associated types (ST25, ST104, ST114). Intriguingly, of the latter three, one was a clinical isolate also positive for esp, a marker commonly associated only with hospital-associated strains. We introduced PCR-based screening for IS16 for all E. faecium isolates sent to our Focal Laboratory for Enterocooci in Germany in late 2007. In 2008 we received 314 E. faecium isolates (from >57 hospitals located in 13 of the 16 German federal states; all VRE) and in 2009 334 E. faecium isolates (from >49 hospitals located in 11 German federal states, 90% VRE) from clinical sources for further analyses. Altogether 99.4% (n = 312/314) in 2008 and 97.3% (n = 325/334) in 2009 were IS16-positive demonstrating wide prevalence of multi-resistant (VRE), hospital-associated strain types in hospitals in Germany. Early recognition of epidemic E. faecium strains is critical for a timely introduction of strategies to prevent and control their further spread. Hospital-associated clonal types of E. faecium often disseminate unrecognized among the nosocomial setting before and until first VRE cases suddenly appear [5, 6]. But standardised methods for rapid diagnostics of these hospital-associated E. faecium strains are missing and modern, DNA sequence-based typing techniques are laborious, time-consuming and comparably expensive. Acquired ampicillin resistance [5, 6, 34] and high-level ciprofloxacin resistance [35, 36] appear as phenotypic traits of hospital-associated strains. However, ampicillin resistance in animal or commensal enterococci is also prevalent to a certain extent , at least in many North American and Asian countries  and the predictive value of acquired ciprofloxacin resistance is limited since it accumulates over time and differently in various clonal types of hospital strains . Several genetic markers, such as esp, hyl Efm or the purK1 allele (used as part of the MLST scheme) are not ubiquitous traits of all hospital-associated E. faecium strains and failure to detect them does not reliably indicate a strain with a limited spreading or pathogenic potential [27, 34, 36, 39–41]. It was also shown recently that hyl Efm is plasmid-located [11, 42], transferable in vitro into several non-hospital E. faecium strains and thus cannot be suggested to serve as a specific marker to predict a clonal background of a given strain . A reliable and rapid molecular test to differentiate commensal from hospital-acquired strains is desirable; results from comparative genomic hybridizations and genome sequencing projects show promising candidate markers including the described insertion element IS16 . According to our data, IS16 is highly specific for predicting hospital-associated strain types (Table 1; Additional files 1, 2, 3). Altogether 155 of the 160 blood culture isolates from 1995 to 2007 from >50 contributing laboratories or hospitals and representing 28 MLST types were all IS16 positive. The comparably high number of (a) participating hospitals/laboratories contributing strains, (b) blood culture strains representing many different MLST types and different van genotypes, and (c) isolated from over 13 years compensates for a geographical limitation of a strain collection that only included isolates from Germany. The presence of IS16 was independent of resistance gene clusters known to possess this element; only 19 isolates were vanB-positive (12%) and the remaining isolates were vancomycin susceptible (n = 67; 42%) or of the vanA-type (n = 74; 46%). Since it is known from previous plasmid analysis that IS16 could be associated with specific plasmid types (e.g., pRUM), we identified the location of IS16 in a representative set of E. faecium isolates (vanA/B/-negative; 29 MLST types; Table 2). Southern hybridizations revealed chromosomal, plasmid and both localizations for IS16 suggesting a somehow restricted mobile gene pool within hospital-associated clonal types. All but three investigated human commensal and all animal strains possessed MLST types different from hospital-associated strains; all but the three aforementioned strains were IS16 negative. 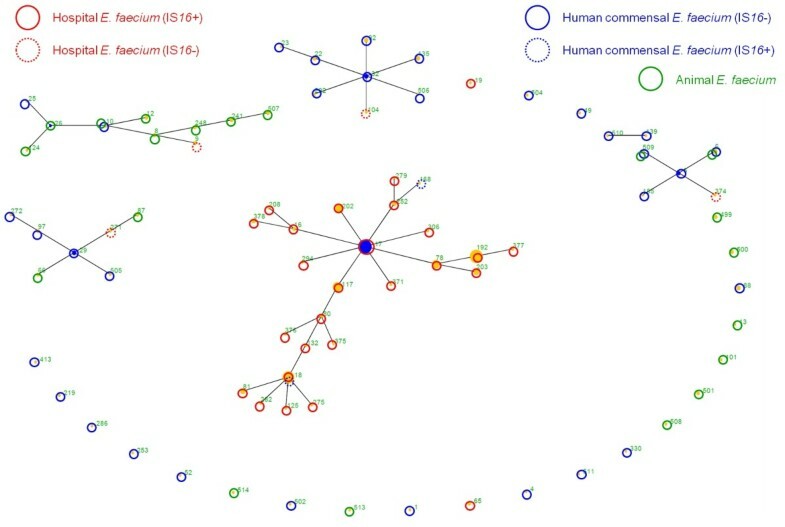 The three human commensal isolates possessing IS16 revealed MLST types ST18 and ST413, allocating them to hospital-associated strains and again emphasising the excellent predictive value of this element for identifiying hospital-associated strain types. PCRs for esp and hyl Efm were negative for these three strains and one was ampicillin-resistant. Absence of IS16 among non-clinical E. faecium strains also suggests a very limited host range of IS16-bearing plasmids (e.g., pRUM-like) only among hospital-associated strains. Prevalence of hospital-associated E. faecium isolates among the general human population is low and more detailed information was only available in one of the three cases. This outpatient from a community surveillance study received beta-lactam treatment during the time of sampling which could be the reason for identifying an ampicillin- and multiresistant, epidemic strain here (association with a hospital stay was not documented). An epidemiological analysis of 648 E. faecium clinical isolates sent to our Focal Laboratory for Enterococci in 2008/2009 from German hospital patients revealed that 98% (n = 637) were IS16-positive, demonstrating country-wide prevalence of hospital-associated strain types among German hospitals in recent years. This finding was supported by wide prevalence of acquired high-level ciprofloxacin resistance among the same strain collection serving as an additional marker for hospital-associated strains . Admittedly, most of the strains from 2008/2009 were vancomycin-resistant showing in retrospect that hospital-associated strains of E. faecium and not commensal strain types accumulated in the nosocomial setting and acquired vanA- or vanB-type resistance determinants. The observation that an IS element, IS16, is among the most specific markers to define hospital-associated strains  appears curious regarding the promiscuous nature of these elements to transpose between several genomic backgrounds within a cell and the possible horizontal mobilization in cis or trans by activation via conjugative elements and subsequent transfer into new hosts. It has been argued that acquisition of specific elements, especially IS16, has contributed to the ecological success of hospital-associated E. faecium strains allowing higher levels of genetic variability including easier acquisition of mobile genetic elements that may support lifestyle in new or changing environments or ecological niches like the hospital environment [3, 44]. Our data show that an IS16-based screening assay appears as the best molecular screening tool to differentiate colonizing E. faecium isolates from hospital-associated E. faecium strains that show an enhanced spreading potential in the nosocomial setting. The predictive value of an IS16 result is superior to the predictive strengths of established tests targeting molecular markers like esp or hyl Efm or phenotypic traits like acquired ampicillin or high-level ciprofloxacin resistance. Progress in comparative genome-based analysis will most probably reveal additional markers to identify hospital associated E. faecium isolates with an enhanced spreading potential in the nosocomial setting [15, 33]. We kindly acknowledge all colleagues working in medical-microbiological laboratories and hospital laboratories sending their samples for further analyses to the Focal Laboratory for Enterococci, Germany, and apologize for being unable to list them all here. The study was partly supported by grants from EC-funded projects ("ACE", LSHE-CT-2007-037410; "TROCAR", LSHE-CT-2008-223031). IK manages and supervises the central enterococcal database and records all typing and characterization data from routine enterococcal diagnostics. UG performed standard PCRs, characterization and identification experiments. CF performed additional typing experiments such as PFGE, MLST and Southern hybridizations. WvS provided seven unpublished genome data and analyzed them regarding genetic linkages between IS16 and neighbouring regions. GW and WW supervised the study; GW selected the primer sequences, evaluated and calculated all the PCR, MLST, PFGE and hybridisation results. GW, IK and WW wrote the manuscript.